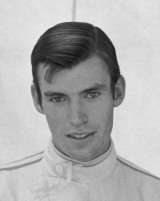 Chris Irwin began racing in the early 1960s, by 1966 he had established enough of a reputation in Formula 3 to be offered a drive by Brabham in the British Grand Prix. He finished seventh and that led to an offer to drive for BRM in 1967. He was the team's third driver, racing for Reg Parnell Motor Racing in what was a year's acclimatisation. He more than justified the decision with some good finishes, none more so than his fifth in France which, but for an engine failure on the last lap, would have been a fourth. The signs were good, but in May 1968 he suffered a terrible crash while practising for the Nurburgring 1000km race and suffered serious head injuries. Although he eventually recovered, he was never able to race again and was left with serious scars as well as epilepsy. He had almost no contact with the racing world for almost four decades before appearing at Thruxton's 40th anniversary celebrations in April 2008.